This is David Dayen writing you. Some of you I haven’t spoken with or seen in a long time, some of you I talked to yesterday. All of you are important enough for me to ask for your help. My first book comes out in less than two weeks. Actually, Amazon has begun shipping orders already, so you can technically say it’s out now. 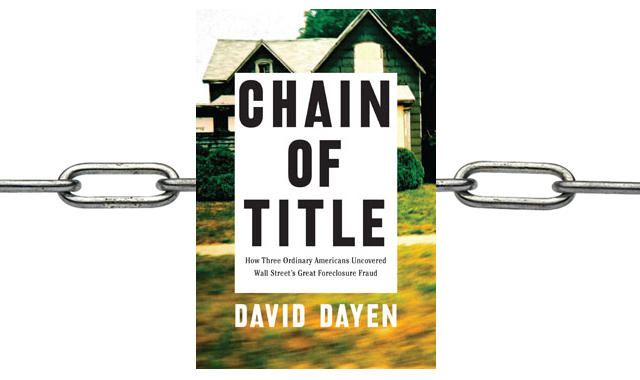 It’s called Chain of Title, and it’s the culmination of six years of work looking at the financial crisis, from the standpoint of those most powerfully affected by its destructive force: namely, the six million families who lost their homes to foreclosure since 2008. Here’s a brief synopsis: Chain of Title follows three individuals in south Florida who were instrumental in exposing one of Wall Street’s greatest secrets: mortgage companies didn’t actually have the evidence necessary to foreclose on millions of homes, and they covered it up by producing false documents in mass quantities and delivering them to courthouses and county recording offices. This cover-up would become the largest consumer fraud in American history, and the deceit ran all the way to the top executive suites at every major bank. The three people who figured it out – Lisa Epstein, Michael Redman, and Lynn Szymoniak – did not work in government or law enforcement. They had no history of anti-corporate activism. They had no expertise in real estate or high finance. They were foreclosure victims who committed a revolutionary act: they read their own mortgage documents, found irregularities, found patterns through months of research, found each other in the comment sections of websites, and made a pact to expose this for the world to see, sacrificing practically everything else in their lives. And if you’re so inclined, you can tell a friend or neighbor about it. Or post about it on Facebook or Twitter. Or write a review on one of the sites above. Any token you can do, no matter how small, will be deeply appreciated and never forgotten. For a first-time author, early support is absolutely critical. My publisher, The New Press, is spectacular, but we’re not talking about a Harry Potter level of advance advertising here. Word of mouth is and has always been the best path for projects like these. So far things have been going well: Publishers Weekly gave it an amazing review (http://www.publishersweekly.com/978-1-62097-158-1), and some awesome folks like Glenn Greenwald, Matt Taibbi, Rick Perlstein, Nomi Prins were kind enough to blurb it. My publisher awarded me the Ida and Studs Terkel Prize for first-time authors. But in the end, readers are what matters. My goal in writing this book was to ensure that this unbelievable story – the details are even better than the broad strokes – didn’t go down the memory hole. I wanted people to know that heroes emerged from the financial crisis, and they pointed the way to an alternative history, one where we prosecuted financial elites for wrongdoing and provided sustainable solutions to keep homeowners in their homes. To honor their contributions I need as many people as possible reading and talking about Chain of Title. Also I worked really hard on it and I want you to see what I came up with. In addition, if you live in Los Angeles, the Bay Area, New York, Washington, St. Louis, or Philadelphia, I’ll be coming to your city for discussions, book signings, and even a couple bar events. All the information on those events can be found at a Facebook page I’ve created for Chain of Title, at Facebook.com/ChainofTitleBook. Just click on the events link to see them all. This is becoming a book in its own right, so I’ll stop. Thanks to each and every one of you in advance. I’m thrilled to share this with the world. being on limited ssa I can not afford this book (Chain of Title) at least not now BUT I too experienced losing my home in Salem oregon to several allegedly criminal service outfits OCWEN/HSBC/AHMSI.. Ocwen took me to Oregon Federal Court, Judge Anna Brown who gave my home to these 3 shady operators who produced NO evidence of stanbding required by Federal Law, YILA. They produced no lawful note, no lawful mortgage, no evidence whatso ever and got Judge Brown to dismiss me with predjudice thus over ruling Judge of 12th Dust Circut Court, Polk County Oregon who awared my home, free of encumbrances to me after he questioned Teresa Shill, attiorney for AHMSI as to wheter or not she had the NOYE to present in court Dec 2009. She responded “no sir I do not have the note” Judge Horner ordered my home to be titled in my name, recorded in Polk County records. Federal Ct Judge Anna Brown, Portland OR overturned Judge Horner and dismiss me with predjudice thus costing me some $399k that AAG was prepared to give me on reverse mortgage. This action put me in deep debt and in the poor house where I remain todat at age 77. I supposedly had a small opportunity for recovery by way of Richard Cordry, Dir of CFPB having set up OCWEN as ombudsoman to repay those of us who were defrauded by Ocwen/HSBC/AHMSI. Ocwen ignored my claim and rejected me. I complained to CFPB and after over a year of refusing me OCWEN claims they are “relooking” my claim for which I doubt anything will come of that based on over 2-3 years of begging them for help.